Cherries... A love story. 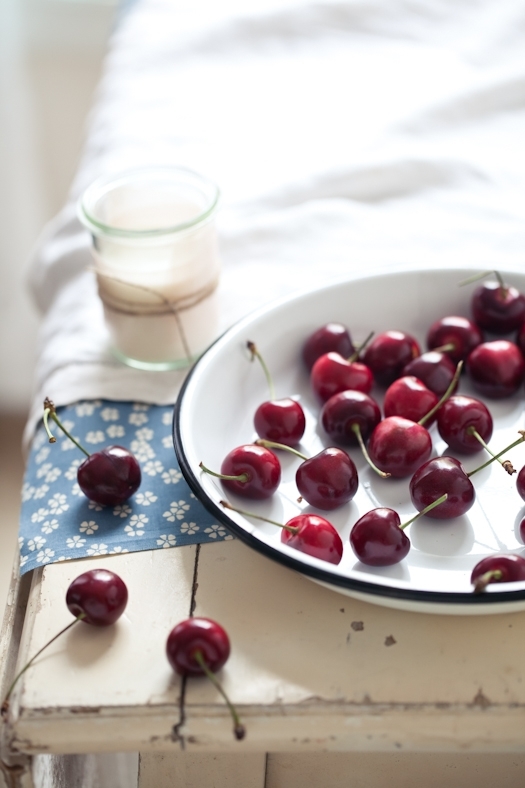 Cherries are still, along with other stone fruits, one of those once-a-year-come-and-get-it-now foods. In a world where so many foods are available year round, which in by no means give them the attributes of tasty and/or affordable by way, that's something I am madly in love with. I live for seasonal eating. It's better on all counts, starting with the intoxicating flavors and scents of recently picked fruits and vegetables. 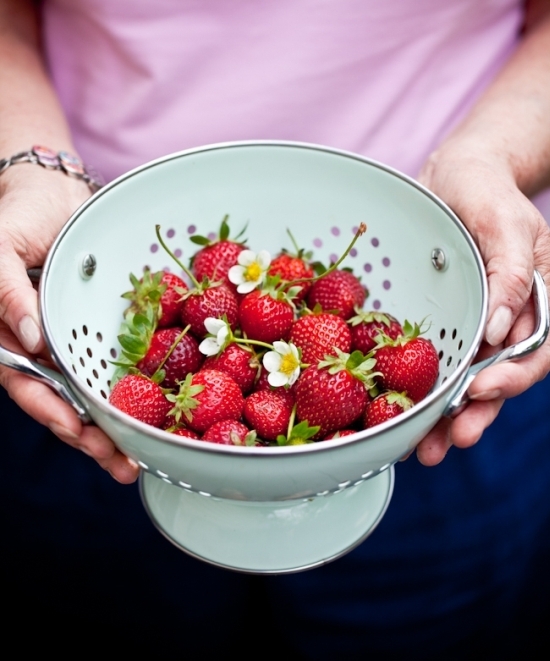 I love the anticipation building up in March waiting for the first weekend we'll go strawberry picking. Waiting for the end of May to bite into the first local peach, juice going down my elbow, its soft skin brushing my cheeks with every bite. Living with blue fingers and tongue all throughout the Summer from blackberry and blueberry picking..and eating...and juicing. With October, I am ready for the local apple crops to flood the farmers maker stalls. 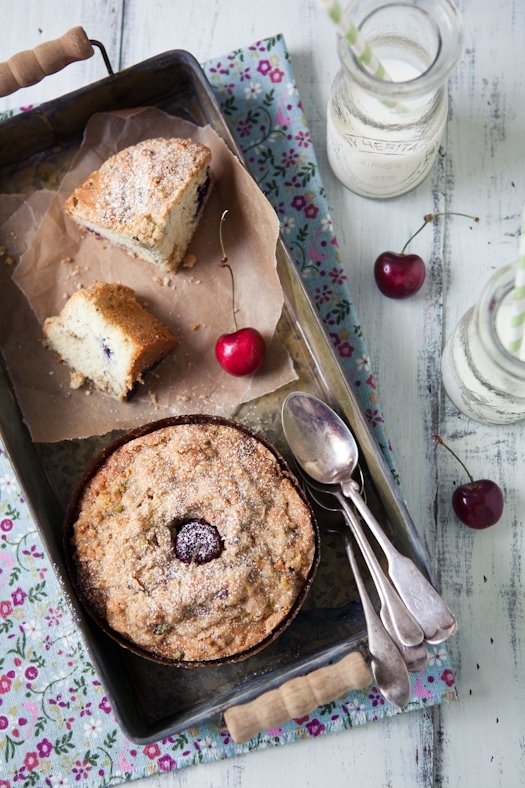 Comes cherry season and it's far more than just love of seasonal food that is awaken in me. It's a whole part of my history. My childhood. My life in France. Nostalgia is definitely a driving force in who I am as a person and certain foods fall right in that category. Not only do they remind me of wonderful times spent back home but they also define my cooking and baking in the present moment. 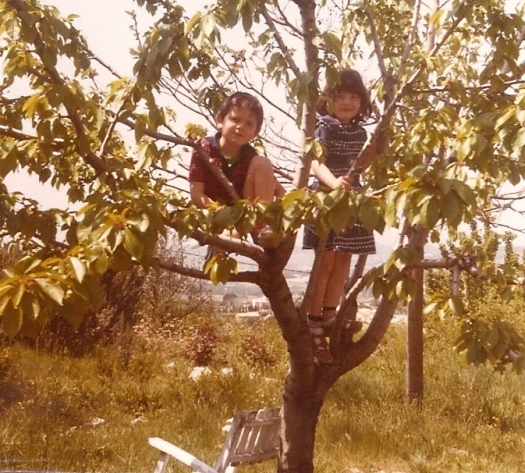 Growing up in Apt, in Provence, we were lucky to have a few cherry trees in the backyard. We had cherry picking parties where friends were invited to lounge under the cherry trees after an afternoon of filling up their baskets. 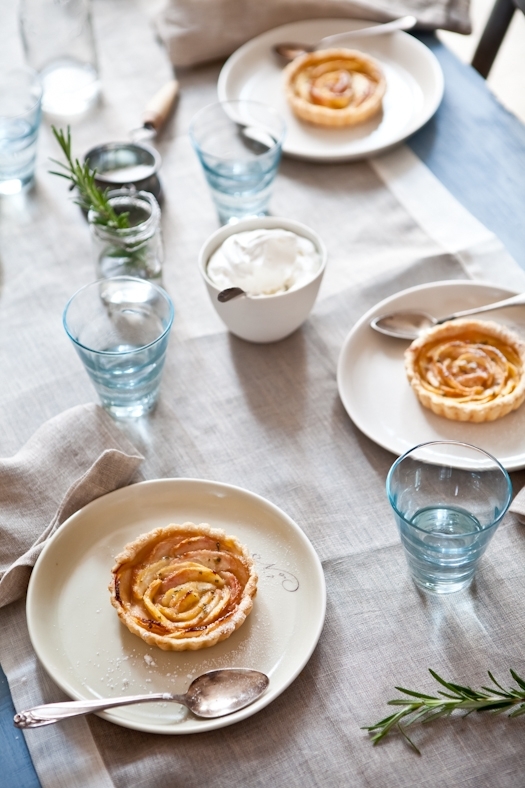 When we moved near Aix En Provence, our yard was a food lover's dream come true. Figs, strawberries, raspberries, red currants, apricots and more cherries. With my brother Arnaud, in Provence. The best moments of my childhood were spent in between rosemary bush, a patch of lavender and perched high on a cherry tree. You can safely guess that there is not one family recipe that does not come with a tug at my heart. 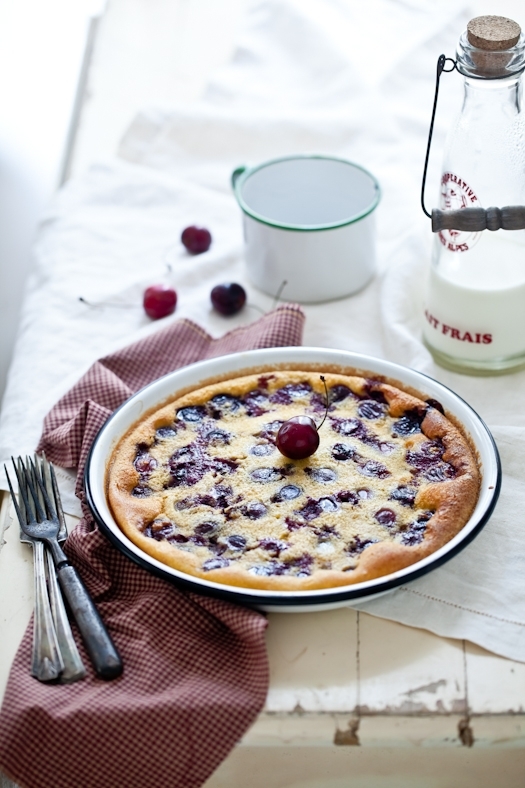 I get the same pinch, tug or pull every time I grabbed the first cherries of the season and make clafoutis. It's like a tradition. Cherries. 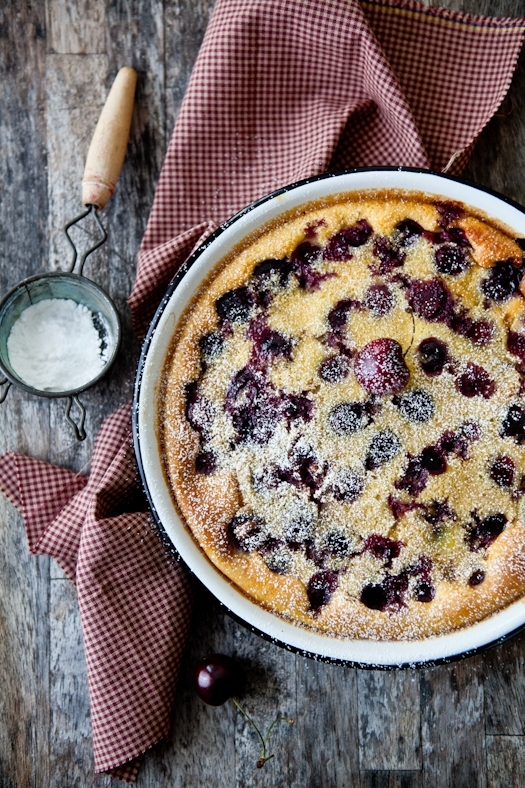 Clafoutis. Repeat. Except there is rarely enough left for anything else. One for the clafoutis. One for me. Repeat again. This time, granted after overloading at the market, I had enough for clafoutis, a cake or two and a salad. One thing I am not used to, even after 14 years here, is the heat. That suffocating heat that grabs your throat and chest. I have learned that the secret to Summer living here resides in three habits: do things at night, do them early in the morning and lastly, do not stop moving. Stopping in that heat will knock the wind from under your sails. So what do we do? We do a bit of all three. We start the work day earlier than normal, do not stop until dinner time and I rarely turn the oven on before 10 or 11pm. I am growing slowly enamored with those evening rituals. I let my mind wander and the nostalgia comes wafting in by waves. Small splashes at first with each lemon zested and egg broken and whisked. Huge floods take over once I set out baked goods to cool and the smells vanilla and sugar whipped up with fruits or chocolate take over every nook and crannies of the house. When it comes to lunch or dinners, we are grilling everyday and eating lots of fresh salads loaded with grains and vegetables. One salad I have completely fallen in love with came as an accident. Sort of. 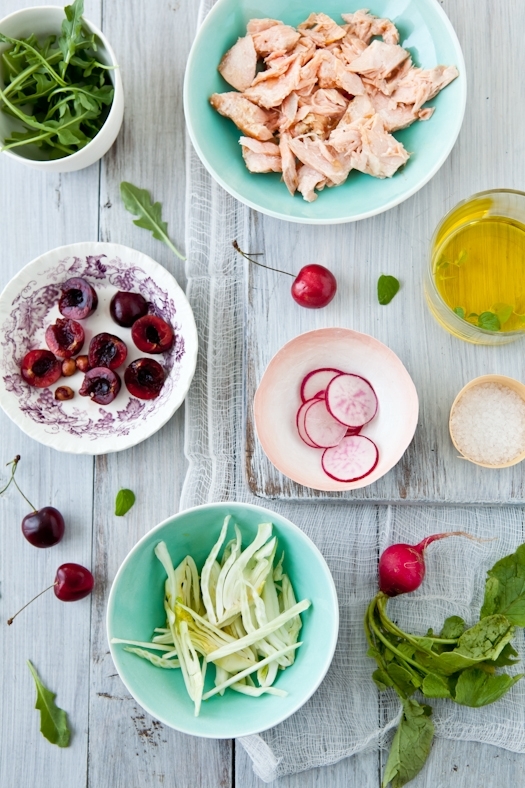 I was already inspired to make a version of this fennel, radish, cherry salad from Beatrice at La Tartine Gourmande intrigued by this combination of the three ingredients. 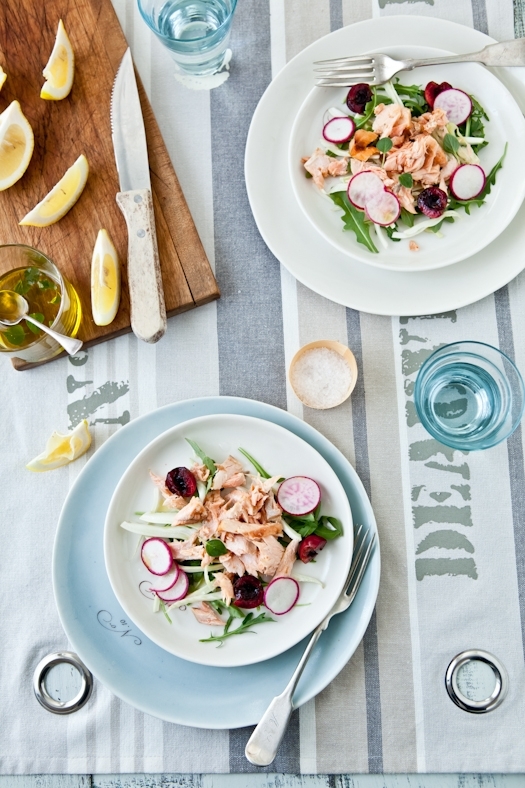 Some leftover grilled salmon one day prompted me to add this to the fennel, radish and cherry combination. A little lemon juice, olive oil and oregano and we were in for the best salad we've had in a long time. Bill asked for seconds. That's rare at lunchtime. He asked for leftovers the day after. We were about to fight over it when I said "there's cherry cake for dessert!". But not just cherry cake.... 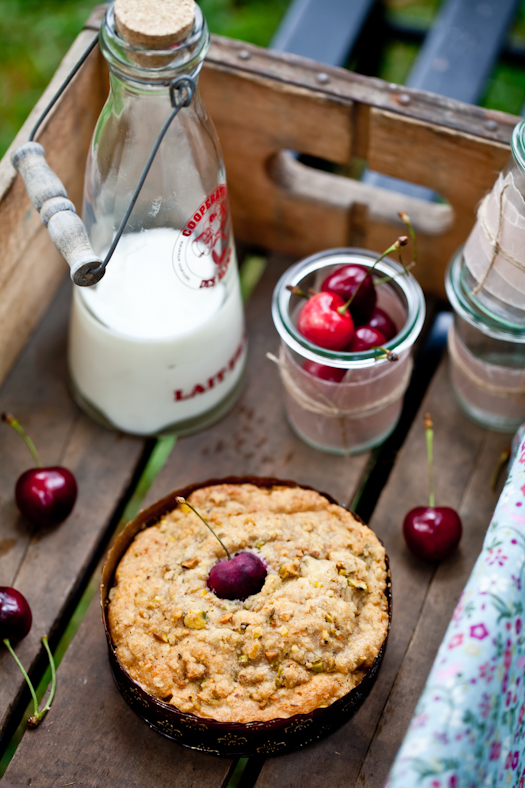 Warm and light vanilla cake loaded with cherries and a pistachio crumble topping. We took advantage of an impeding storm to head out to the yard and enjoy a few short minutes of a cool breeze passing by. Under the pecan tree this time. Hope you enjoy the cherry recipes after the jump! Someone needs to hold me back...I am slightly nervous that there is no clafoutis for dessert tonight! Ahaha! Have a great week everyone! 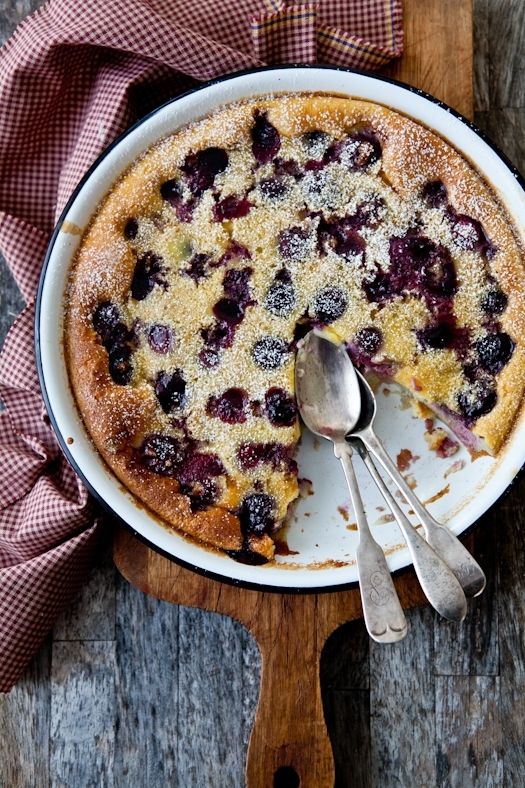 It's like Summer does not officially start unless there is a clafoutis involved. The recipe originated with my grandmother and years after her passing, it's my way to pay homage to her ways around the kitchen. And was she a fine cook. And a loving one too. There was never one of anything. Probably why she had six children too. Ah! Preheat the oven to 350F and position a rack in the middle. Place all the cherries in a 8-inch round pie tin slightly coated with some melted butter (or cooking spray if you wish). In a large bowl, whisk together the eggs and honey until well combined. Add the milk, cream and flour and whisk until smooth. Slowly pour over the cherries, trying not to disturb them too much so to speak. Bake for 30-40 minutes until golden brown. Serve at room temperature with some powdered sugar dusted on top if desired. Makes one 10-inch cake or four 4-inch ones. Put all the ingredients, minus the nuts in a food processor and pulse until it forms coarse crumbs. Put into a bowl, sit in the nuts , cover and refrigerate while you prepare the cake. You can do this by hand, mixing in all the ingredients together, just make sure the butter is super cold. Combine the flour, baking powder, baking soda. Stir and set aside. In the bowl of an electric mixer fitted with the paddle attachment, mix the butter and sugar together with the lemon zest until creamy looking. Add the eggs, one at time. Scrape the bottom of the bowl to make sure it is all combined. Reduce the speed and add the the flour mixture and milk alternately, starting and ending with the dry ingredients. Stop the machine and with a spatula gently stir in the cherries. Pour the mixture into your preferred baking pan, coated with cooking spray. Spread the top with the crumb topping. Bake for about 45 minutes for one single 8 or 9-inch cake and about 30-35 for smaller ones. This is more of a method/ingredient list than a precise recipes since quantities change with what I have on hand and according to our tastebuds that day. Feel free to experiment with little of a lot of each ingredient! 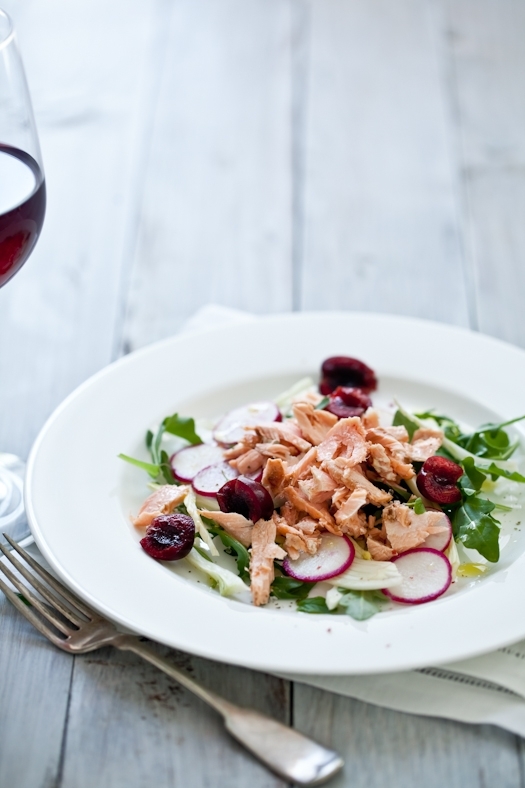 On four plates, layer the arugula, fennel, radish slices, cherries and salmon flakes. Drizzle with lemon juice, olive oil. Season to taste with salt and pepper and sprinkle with some oregano. You can also mix all the ingredients in a large bowl and mix well with the lemon juice, olive oil, salt pepper and oregano. Divide among 4 serving plates. 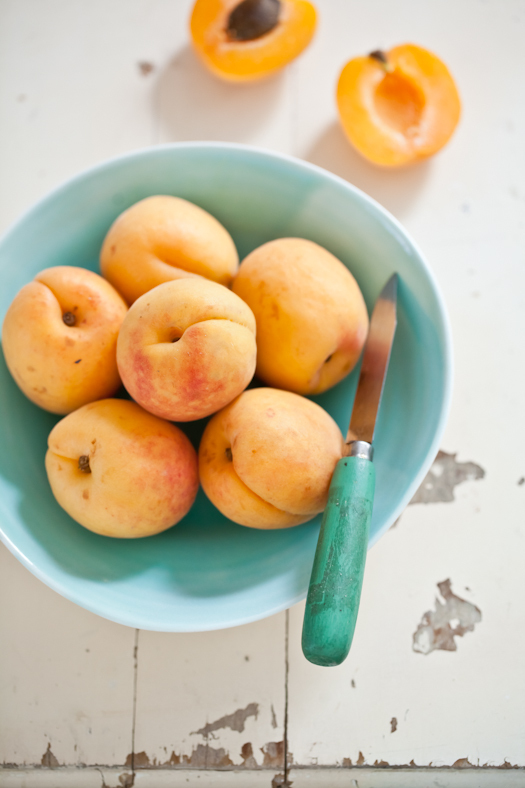 Honey Apricots With Pineapple Sage Financiers & Some Farmers Market Fare...Plus, An Awesome Macarons & Photo Workshop! When we dropped our friend J. at the airport yesterday, it felt a little like dropping off your kid to camp. Mind you the kid has just turned forty years-old but that sparkle in his eye about finally getting some vacation time was precious. I almost ran to an airline counter and bought a ticket home! One wonderful aspect of my job as a food photographer is that whether I have a magazine or a cookbook shoot, 100% of the food I work with is edible and unless a shoot is taking too long and the food is not kept refrigerated properly, we eat what we now call "shoot food" for dinner. Also, as a food lover who tends to overload at the farmers market, it's a blessing to have single friends like J. who are just a phone call away and hungry to come share our victuals and a glass of wine when I spend an entire day cooking and baking. We often joke that our table is more often set for four or six than for two. Over the few years, J. has been the recipient of quite many a phone calls to come and eat my "shoot food". 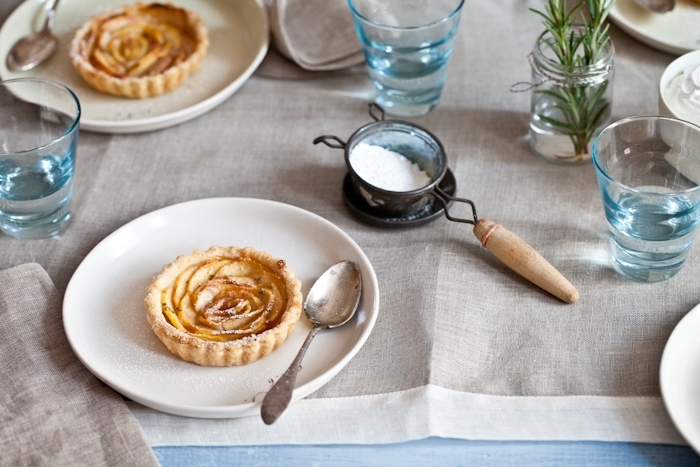 From eight tarts in one single night to three stews and beaucoup caramel cake in a weekend. What can I say... I like fresh and seasonal food, and I like to feed my friends. J. loves vegetables. He has an adventurous palate. He likes to buy cookbooks and brings them over to the house so we can brainstorm our next "market dinner". While Bill and him go play some music (they are both musicians), I cook and bake to the sound of old time jazz tunes. Since I always post on Twitter the contents of my basket after the Charleston farmers market on Saturdays, I thought I'd blog about some of the dishes I make from all those goodies and often share with friends. Like J. As we did last week before his long trip overseas. One thing I love doing when we get home from the market is to fix us breakfast since we usually get up and go to make it there right at opening time. I am not a huge breakfast person except on Saturdays. A bed of arugula, some sauteed bacon and an egg. Over easy, sunny side up, poached...any way works for me. I have taken to sauteed some halved grapes with the bacon lately and the combination of savory and sweet it just outstanding. 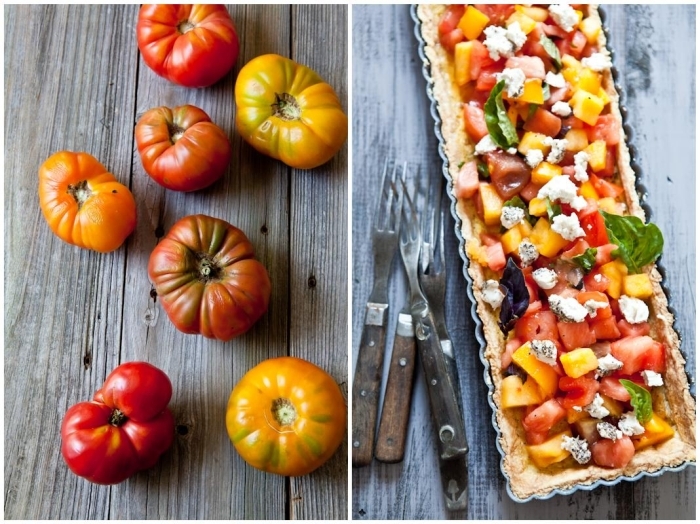 We are in full blown tomato and heirloom tomato season and that makes me very very happy. We can't get enough of them. I literally go nuts with the tomatoes at the market. 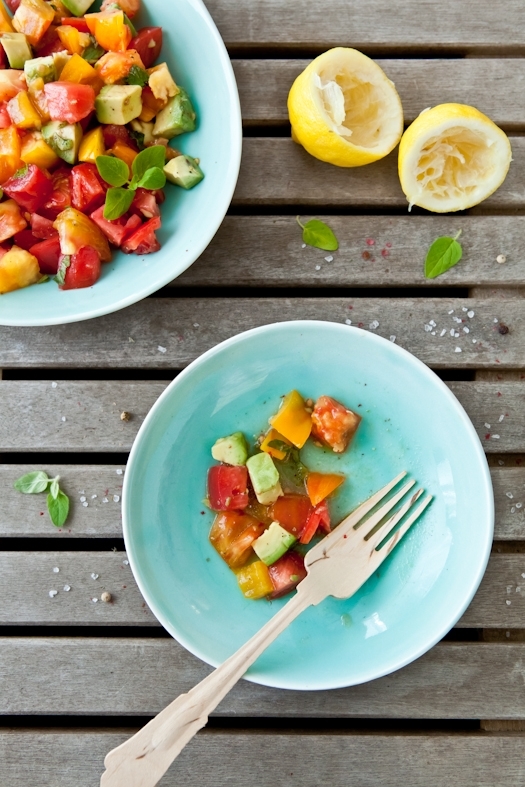 We like to eat them simply in a salad with some chopped avocado, lemon juice, salt and pepper. Sometimes a sprinkle of basil. Sometimes oregano. Sometimes I just make a simple pie crust and fill it with cut up tomatoes, fresh goat cheese, a drizzle of olive oil. It's messy. It's fresh. It's delicious. I would never have thought I would get Bill to actually ask for turnips or beets for dinner. But he does. Specifically the ones from the market. They are super fresh and sweet and when I roast them with some salt and pepper, he just can't get enough. I roast a batch in late afternoon and we snack on those while I prepare dinner. Nature's candy. Seriously. 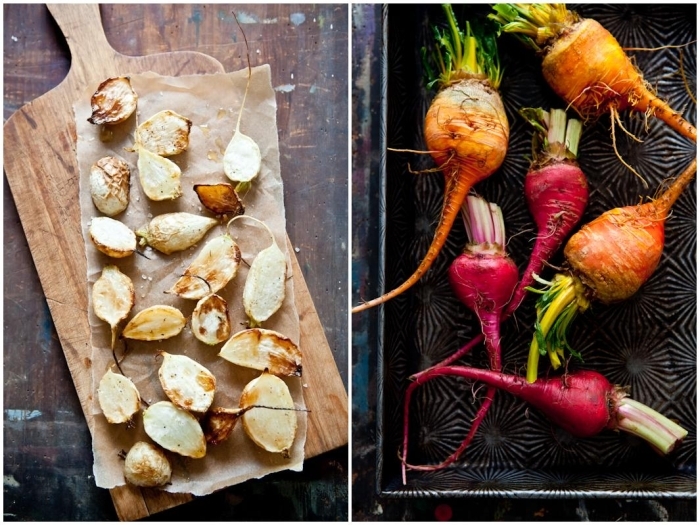 Our market is a food lover, food photographer's dream come true. Not only are the vegetables flavorful, fresh and delicious, they also look good. 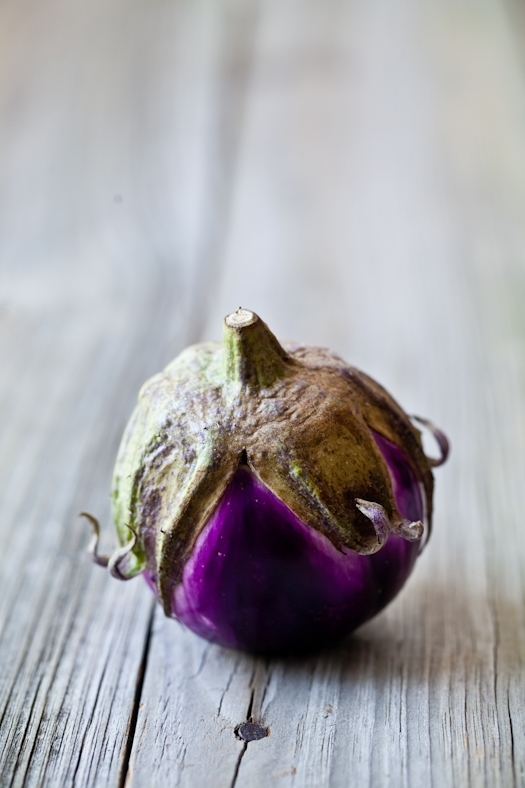 I can't stop myself from picking up tiny baby squash or amazingly purple round eggplants. And purple onions. And purple basil. It makes for a beautiful gratin just by layering them all together. A good drizzle of cream and thanks to Nigel Slater's book Tender we had the silkiest of side dish the other night for dinner. Dinner at our house would not be complete without dessert of course and lately, we have been drowning (my fault) under cases of apricots. One of my favorites. 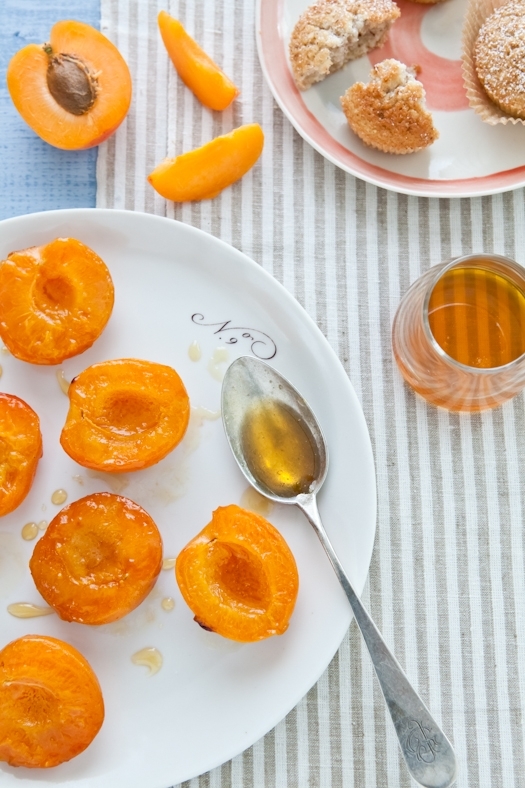 I am picky about my apricots and this year they are amazingly fragrant and tasty. We have enjoyed them sauteed in a bit of raw honey and served along side cookies or tea cakes like the hazelnut financiers pictured here. 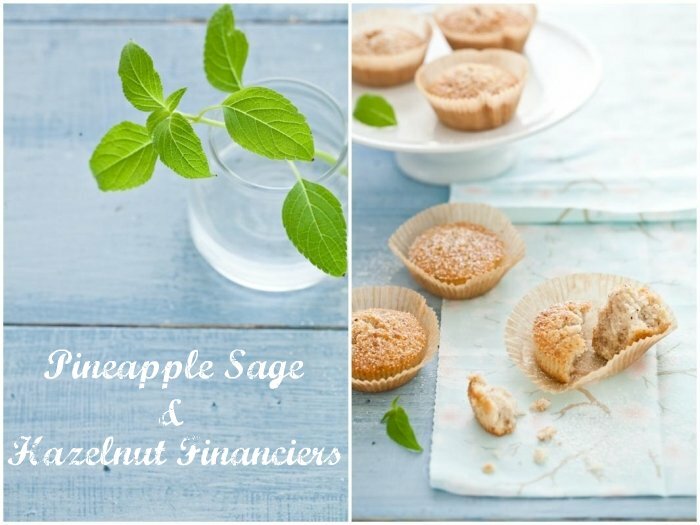 I recently discovered pineapple sage and been adding it to plenty of dishes, sweet and savory. It's mild, smells like pineapple and adds a lovely fragrance to tea cakes. Lemon thyme, lemon verbana lemon balm, pineapple sage...all these mild herbs lend themselves perfectly to sweet treats. I was particularly happy to curl on the couch Saturday night with a couple of financiers and some of those honey apricots. We had just driven home from my book signing in Charlotte and I was just craving something sweet and tangy. The trip was a lot of fun and it was awesome to finally hang out with Taylor in his hometown and meet some of the Charlotte food bloggers. Thank you to everyone who came to have a book signed or just say "hello", it was an honor meeting you. Of course, it was nothing like one of The Pioneer Woman's book signing where people line up for hours just to talk to Ree! Speaking of which...It's been hard keeping the secret of a little weekend that Ree and I have been organizing but it's finally here! I am extremely honored that Ree has invited me to come to her ranch to teach a couple of workshops July 23rd-24th. Yes! One will be on how to make macarons and the other on food styling and photography. 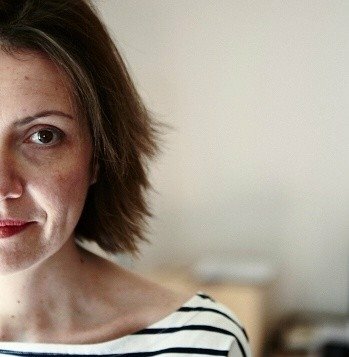 She is giving the chance to 3 readers of her blog (and their guest) to come and spend the weekend learning, baking, photographing...and of course laughing and eating! You can enter the giveaway on her blog here! I can't wait! The best part? The minute I told Bill about what we were doing he said "I'm coming!" Then he added "let's do a road trip there!" It's been ages since we took a road trip together and we just love doing those. Granted I catch up on sleep but we love to discover new towns and new storied. Once I have the itinerary mapped out, I might ask some of you for recommendations of all kinds. In the meantime, I might just sneak away the last of the Hazelnut Financiers and Honey Apricots. And wait impatiently for dinner and a serving of that Eggplant Gratin...! Preheat your oven to 375F and position a rack in the center. Lightly butter the inside of 12 financiers molds or muffin tins and place them on a baking sheet. Set aside. In a medium saucepan set over medium high heat, melt the butter until it turns to a rich hazelnut brown color. Remove from the heat and let it cool for 5 minutes. Strain and reserve. Mix together the powdered sugar, flour, ground hazelnuts, pineapple sage and salt in the bowl of a stand mixer fitted with the paddle attachment. Add the egg whites and mix on low speed until all the ingredients are coming together. Add the brown butter, increase the speed to medium and beat until smooth. Divide the batter among your molds and bake for about 15 to 20 minutes or until golden brown. Preheat the oven to 350F and position a rack in the middle. 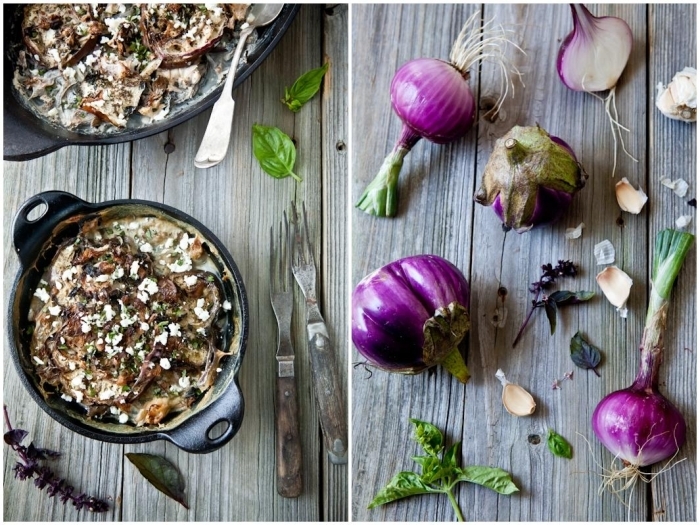 In a 9x9 inch gratin dish lightly coated with a bit of olive oil, place some eggplant slices in a single layer. Top with a single layer each of onion slices, diced mushrooms. Sprinkle with some garlic, chopped basil and salt and pepper. Repeat the layering until all the vegetables are used. Pour the cream over the top and bake for 30-40 minutes until golden brown. Up until an hour ago, I was having one of those posts starting with a sentence I'd write and erase, and re-write. Not anymore. Obviously. Here are three sentences I have not started over. Yet. So much I have to say and about the same I'm still trying to wrap my head around. First, it may sound like a broken record, but if I don't say this a gazillion times, I won't say it enough: for all your emails, tweets, facebook notes and messages telling me how much you are learning from the book... Thank you. Thank you from the bottom of my heart. To hear you say that you are inspired by its content, its approach, its voice, leaves me humbled and honored. It's been giving me a smile on my face and a skip in my step this past month and a half that the book has been out. It's always a bit of a struggle talking about Plate To Pixel. I want the book to do well, for all the people who have worked hard on it. I was proud of it when it was just a PDF on my laptop. I am even prouder of it now that I read your messages. I am excited to see it in your homes, to get your "before" and "after" shots. I am even more excited for the space left within for more details, for a sequel. I am however completely left uneasy when a friend comes to the house with a copy to be signed. When my mother-in-law sends her aqua-aerobics group to buy a dozen copy at the bookstore or when my husband beams with pride when someone says "I heard Helene's book is out" and he picks up a copy from the coffee table. It's surreal. It's awesome. It's weird. I have no idea whether to smile or run. So I usually sit there and take a deep breath, inhale the moment and silently thank the person across from me for the time they are giving me. I've been doing this for weeks now. Almost two months actually. It seems like an eternity and it seems like yesterday. I know. It's cliche. Well that's fine. It's corny. That's fine too. That's perfect actually. I can do corny. That I know. I just don't know what authors are supposed to do. I have never done this before. "Breathe" "Take it in", "Enjoy"...Yes. I do that. Then a couple of trusted friends, my editor also, mentioned I should have a book release party, a book signing, a book tour. Ugh. Oh. I did have a party. For close friends in town, around a good dinner and a few bottles of Champagne. It made more sense to do it that way. They had been there during the writing, the rare moments of frustrations. I wanted to thank John for always making me something tasty to eat when I was too preoccupied to find my way into the kitchen. I wanted to thank Fanny and Patrick for pouring me a glass of wine and mandating I'd take a break. I wanted to thank those friends who made fatigue disappear and mended my soul with their kindness. And then the book was out, shipped off to you and I went back to work. Shooting, writing, styling, shooting some more. That's my element. Then about 2 weeks ago, I was staring at my Twitter feed when it hit me. Here were three bloggers who were discussing the book and getting excited to learn from it and by including me in their exchange, it really hit me hard on the head. I got quiet again. I wanted to shout "thank you!". I did. But I wanted to shout it again and shake someone's hand and give them a hug too for letting my work be a part of theirs. The words book tour and book signing were reiterated by dear friends again. So yes. After taking the book on a little christening of sort in Sante Fe late April, I am officially taking the book around the US, little by little, one workshop at a time. I am writing it out loud so I can allow myself to say "I wrote this book and I think you might find it full of great pieces of information." Yes! Again. I found that I am much more comfortable giving a workshop as I take that baby out into your worlds. So...I am kicking things off this weekend with a book signing in Charlotte, NC on Friday the 17th from 1.30pm til 3pm or so at Amelie's Bakery. Big thanks to Taylor for getting it organized! If you are in the area, come say "hi"! Would love to meet you and thank you! Next month, I have the great honor of returning to Evo 11 in Park City Utah as a speaker on July 7th-9th where I'll do a food photography workshop. And while this is separate from a book tour, the wonderful Rachael and Jyl, the founders of Evo, have suggested bringing a few copies for a giveaway. While I am still working the number with my editor, I wanted to extend a warm Thank You to the Evo 11 team. Woot! Separately from the conference, when I told my dear friend Maria that I would be in her neck of the woods again, we started talking about doing a book release event of some sort for Plate To Pixel. A few emails later and because it is a technical book, the concept of a Book Workshop Tour came about. 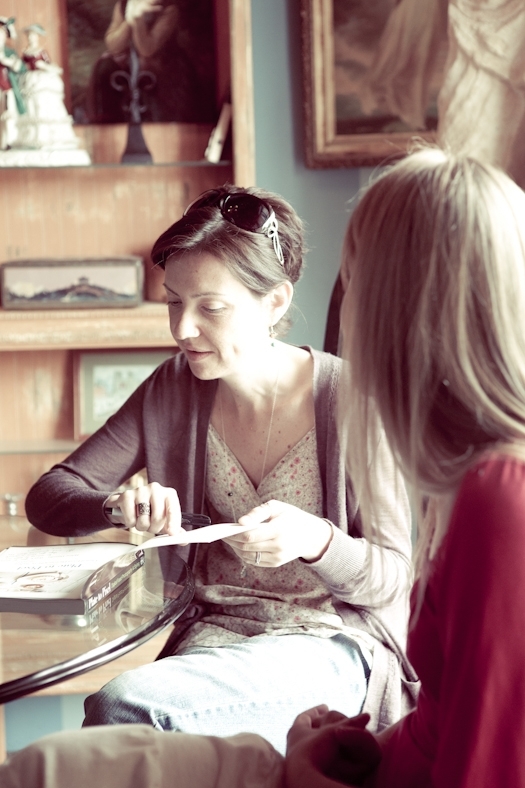 So...The Plate To Pixel Book Workshop Tour(!) will indeed stop in Salt Lake City, Utah, on July 6th! The 4-hour workshop will be held at the Market Street Grill at Cottonwood, from 10am til 2pm. There are 12 spots available. It will be completely hands on and I want everyone to be able to benefit from one another and get as much out of it as possible. So yes, a small group is ideal. UPDATE: The workshop is full and registration is closed. Looking forward to meeting you if you signed up! If you are interested in attending, shoot me an email at photoworkshopslc @ gmail . com and I will send you a packet with the class description, class fee and how to register and secure your spot. That's not all though! The wonderful Heidi at Foodie Crush who literally put this whole thing together on her own, is sponsoring one person to attend the workshop for free! For a chance to win a spot at the workshop held in Salt Lake City on July 6th and brought to you by Foodie Crush and Market Street Grill, head on over to Heidi's site and follow her instructions. But this coming weekend, it's Charlotte first! In the next week, I will be putting up a page dedicated entirely to the Plate To Pixel Book Workshop Tour with an ongoing list of the cities I will be traveling to, doing workshops and signing books. Here is a tease of an awesome two day cooking and food photography workshop I will be doing with Squam Art Workshops, in New Hampshire in September. More details soon! If given a choice, I will rush to grab white peaches without hesitation. They remind me of those we get back home. Some are white inside and some have rosy tones instead. Their peach flavor is bit more subtle than the yellow varieties but just as juicy and delicious. Mix together 1/2 cup granulated sugar with 2 tablespoons finely chopped fresh rosemary. Sift together the millet flour, corn flour, potato starch, sweet rice flour and salt in a large bowl. Cut the butter into very small pieces over the dry ingredients and quickly work it in the flours with your fingertips until you get large sandy pieces. Make a well in the center of the flour mixture, add the egg and water and start working the dough from the outside toward the inside of the bowl, quickly moistening the flours and gathering the dough into a ball. Wrap in plastic wrap and refrigerate one to two hours. Butter and four 8 mini tart shells. Remove the dough from the fridge and let it sit at room temperature for about 10-15 minutes. Roll the dough between 2 pieces of parchment paper to about 1/4 to 1/8 thick. Cut out circles a little larger than your tart shells and place them inside the tart pans, flush the borders with a sharp knife. Refrigerate for about 30 minutes. In the meantime, prepare the sugar and peaches. 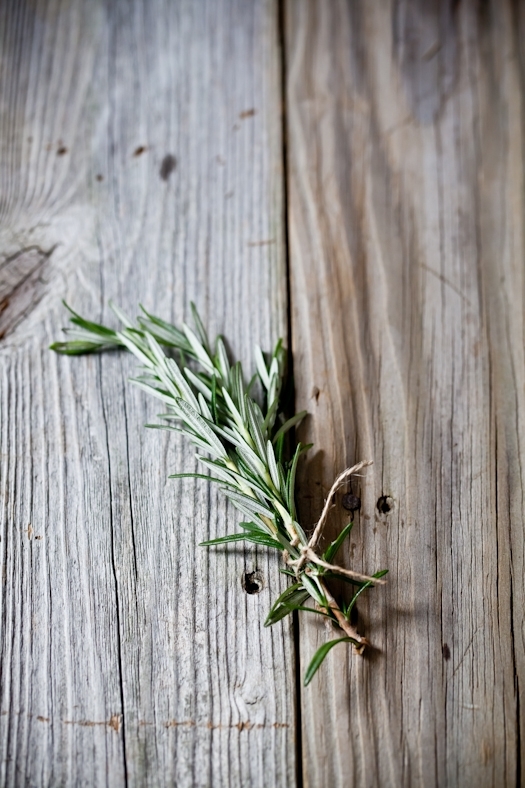 For the sugar, just rub the rosemary into the sugar to release its natural oils. Set aside until ready to bake. 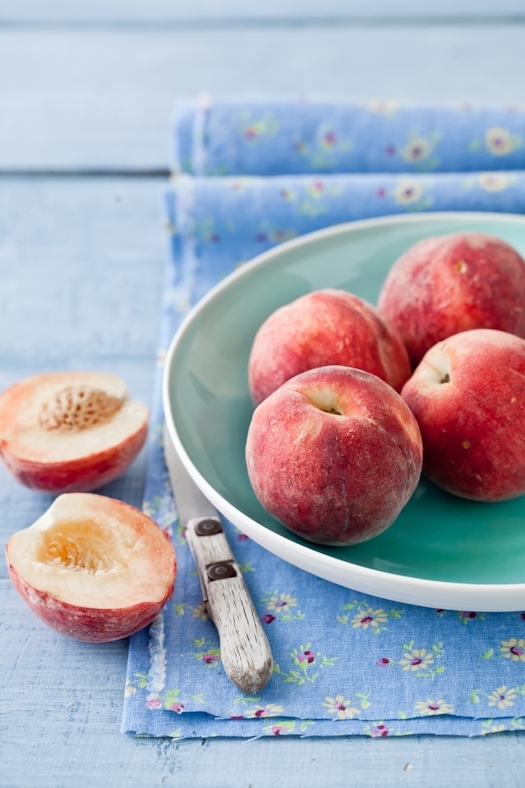 To prepare the peaches, peel them, cut them in half, remove the pits and cut into thin slices. 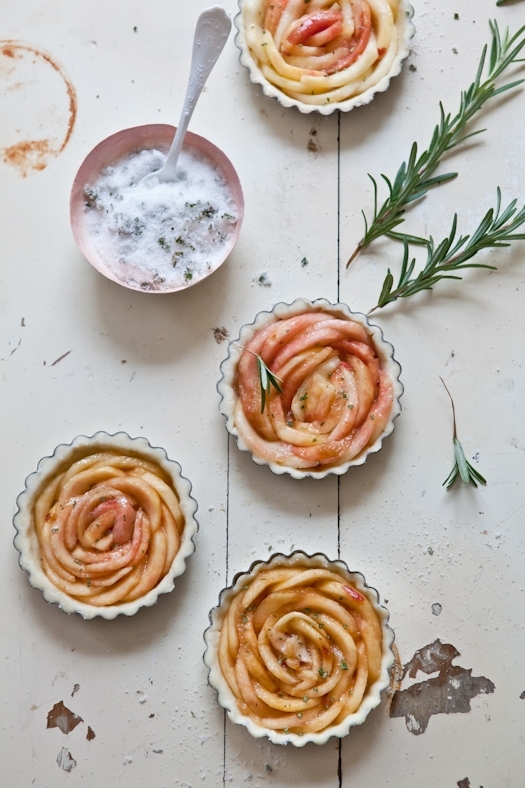 Assemble the tart by placing peach slices in a decorative patterns inside the shells. Sprinkle with as little or as much rosemary sugar as you wish. When ready to bake, preheat the oven to 350F and position a rack in the middle. Bake for about 30 minutes, until the shells start getting golden brown and the peaches release their juices. It's a simple truth that we really enjoy having friends come to dinner. Winter nights are definitely cozier sharing a piece of chocolate in front of the fireplace. Summer evenings in our neighborhood are balm for the soul. Kids playing, biking, laughing hard. Food improvised and shared when conversations carry on well after sunset. Cookouts, fishing, sipping wine on the back decks. All that's missing is a good game of pétanque! Neighbors have come and gone in the years that we have been on this street but by some random and kind act of life, we have always had great people moving in around here. Not everyone was familiar with Southern hospitality but withing a few short weeks, you can tell they warmed up to it. We all take turns keeping up with the common areas duties. We all share crab traps and fishing rods. We all find ourselves in a storm tightening boats to the dock. Sounds awesome, doesn't it? Well, it is... And sometimes it hides the obvious from right under your nose. Take our neighbors and friends Pam and Steve for instance. They moved in a couple of years ago and we have spent many times chatting, comparing garden work, exchanging dog stories, etc.. However, after two years of cookouts and barbecues in the neighborhood, we had not had them over for dinner yet! So on one of the hottest days of this week, they walked to fifteen steps from their front door to our back porch and came for dinner. We knew we already liked them but we did not know why and how much. Now we know. Air force, cancer, moving, traveling, Europe...all these words came and went several times in the course of the evening. Lots of anecdotes and experiences rang familiar to Bill and myself. And we listened and talked for hours. With pleasure. We had bubbly chilling in the fridge, plenty to eat and the grill all set to go. The heat and humidity were overwhelming so I kept the menu fresh and simple and made a commitment not to turn the oven on! We put some shrimp on the grill, made a huge field pea salad with avocado, onions, red bell pepper, a mozzarella and heirloom tomato salad. The highlights of the meal were the cantaloupe and speck ham with arugula plate I served as appetizer and the rhubarb and berry consommé we had for dessert along with some freshly made financiers cakes. Super fresh and simple. 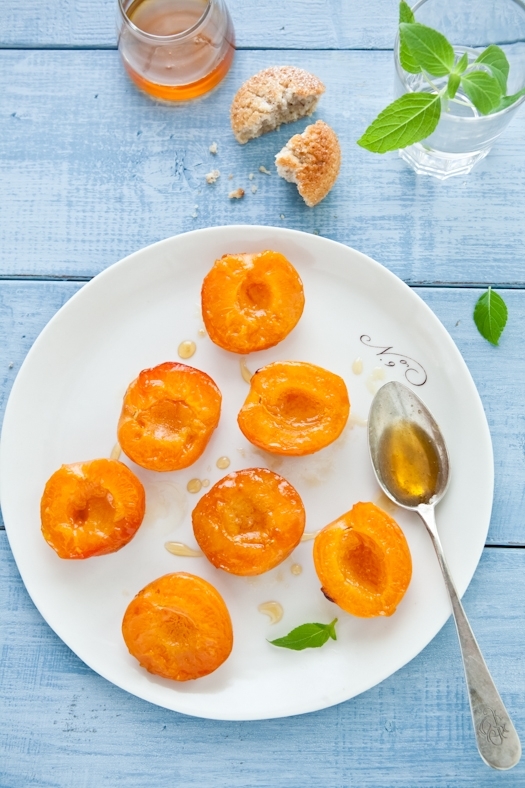 Out of the many foods and dishes we enjoy during the summer, we clearly have our favorites such as apricots, peaches, berries and cantaloupes. In the winter my mother would always start our meal with a soup. 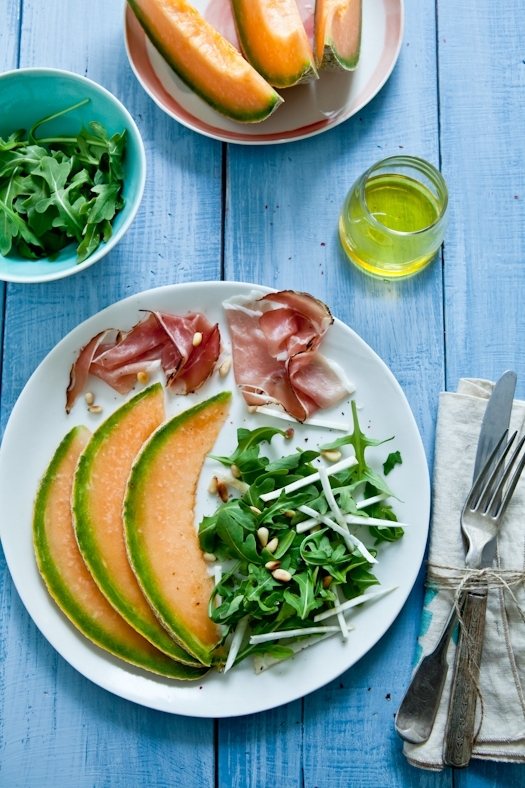 In the summer, it was a slice of cantaloupe with some prosciutto or speck ham (and a drizzle of port for the adult!). Years later, miles away, I do what my mother did then. 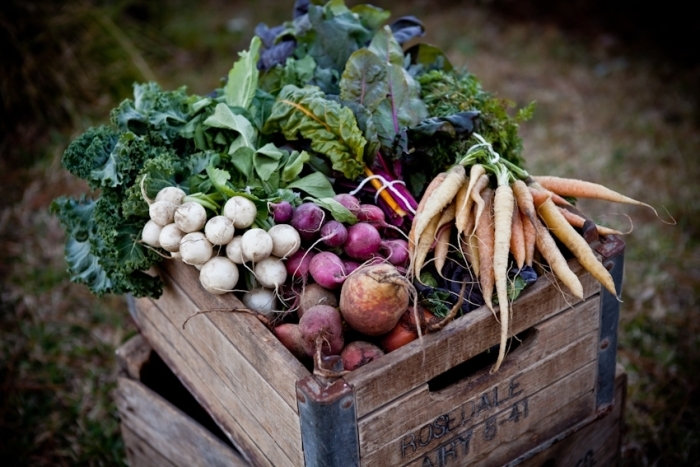 With produce this seasonal and this good here at the market, there is no excuse not to! The cantaloupe and speck plate is inspired and adapted from all the various versions I have had since I was a kid while the rhubarb and berry consommé is adapted from a recipe in the summer issue of Elle A Table that my mother brought me when they came to visit. Once a year I get a suitcase full of French food magazine and yes, it does get me an entire year to read through them all! Celery root: I cut it in little batons and I like the crunch it provides the salad, but you can omit it or use jicama if you prefer. In a large saucepan, bring the water and sugar to a simmer. 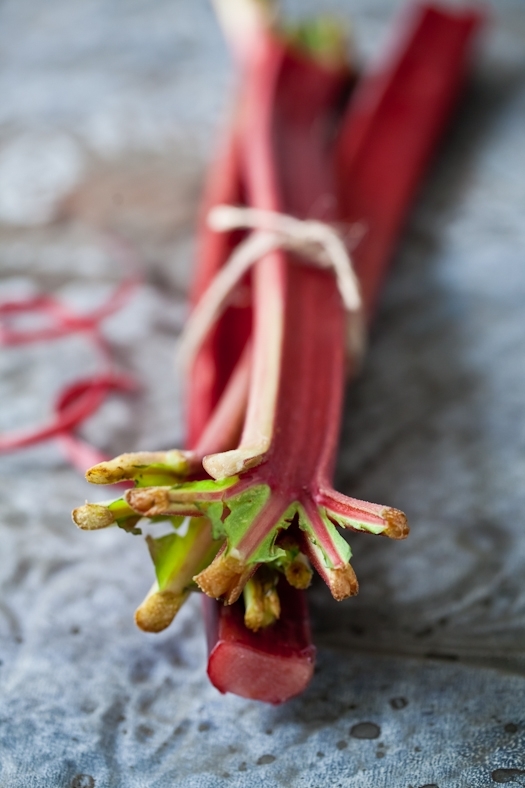 Add the rhubarb sticks and cook over medium heat two to three minutes. Remove from the heat and throw in the lemon verbena. Let cool completely. 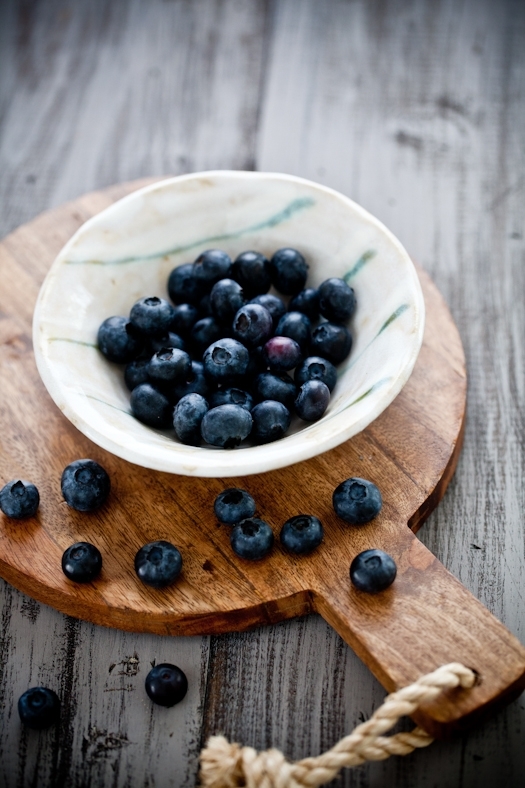 Add the strawberries and blueberries and refrigerate until cold. When I called my mother yesterday I had a burning question to ask her. As soon as we started talking, I completely forgot. I was outside on the deck and heard a plane over my head. Felt a cool breeze through the pecan tree and just sat there. It took me back to our chalet in the Alps on a hot summer day. Gliders brushing the mountain sides, kids biking furiously to the pool. I got pensive. Mostly I had a smile on my face. I got quiet for a little while and she asked if I was getting sad as we talked about summers, the cousins growing up, their travel plans, etc... I mumbled "I'm fine! I am testing the mixed berries sorbet I just made!" She asked if I could focus on the conversation to which I replied "no can't do. Do you still have your T-Fal sorbet maker?" I had remembered my, well at least to me, burning question. Her turn to get quiet for a while "I have no idea. Why do you ask?". I knew I had piqued her curiosity. "No reason. Everytime I make sorbet I think about that darn sorbetiere and how much we'd crank it up in the summers. It was cool. It was special." It was special indeed. I'll always remember the day my mother brought that sorbet make home. 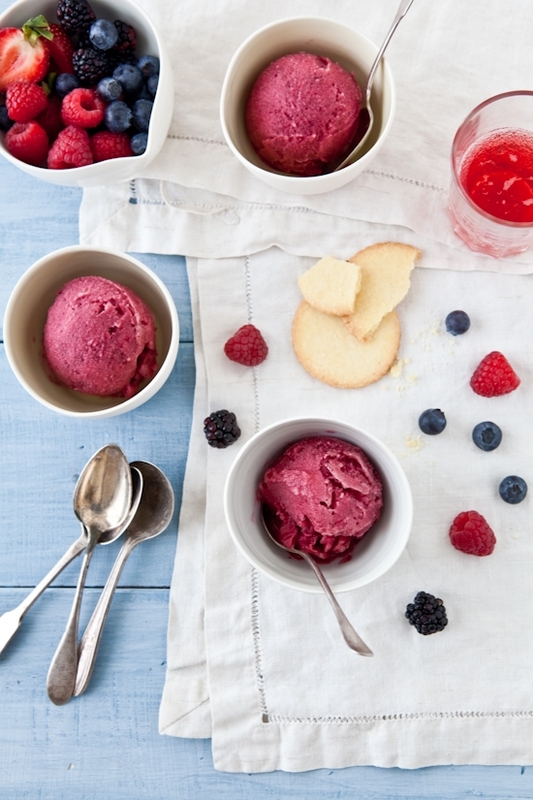 Homemade sorbet anytime we wanted? As kids it was like Christmas in July! See, in France, desserts eaten at home during the week are not buttery flaky pastries bought at the corner bakery on the way home from work. Those are for Sundays. No, desserts often consist of a dairy product and a fruit. 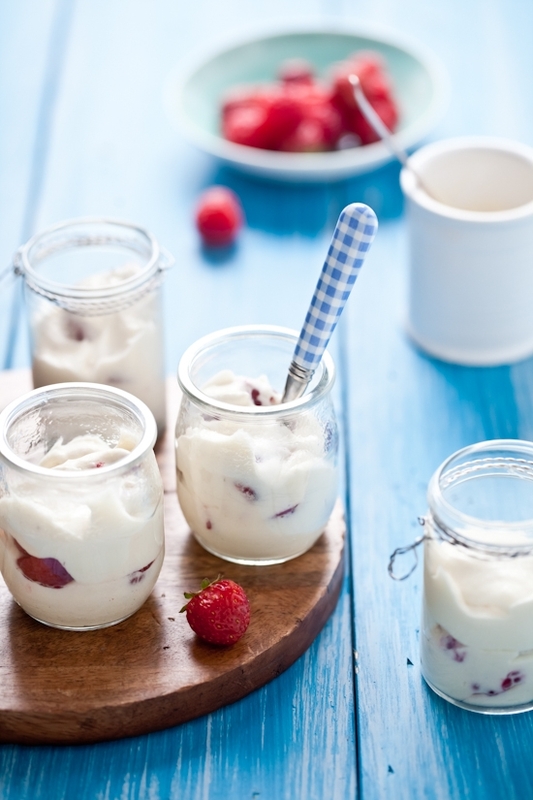 I grew up on homemade yogurt and fruit for dessert. 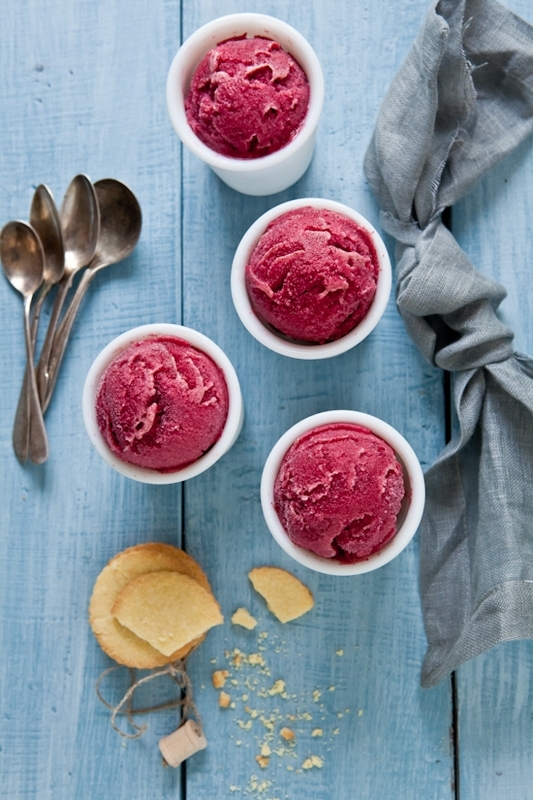 Ice creams and sorbets were not only specials, they were a once a year kind of thing. They spelled Summer. It was a special thing indeed to have sorbet or ice cream or pastries back home. I do the exact same thing here. 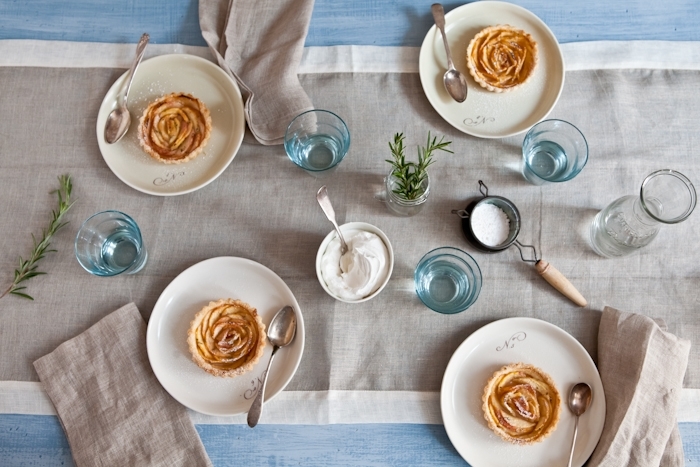 The weekends and dinner with friends are meant for special treats. And for good reasons. Time on slower motion is something to be celebrated (I'm always on even when I'm off. Can't help it). Time spent with friends is celebrated. The generosity of their sharing our table, their time and stories with us. I want to acknowledge that by making them something special. 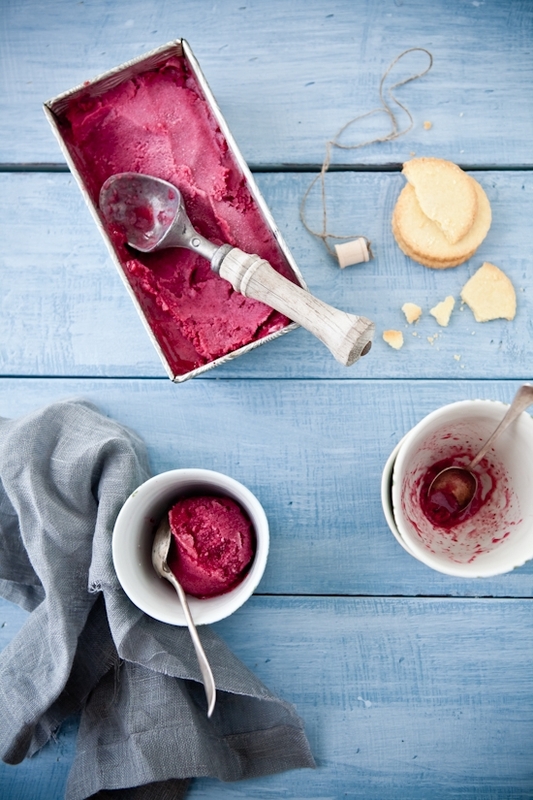 Enter sorbets, ice cream, tarts, mousses, and all sorts of goodies I enjoy making. I enjoy seeing their shoulders drop and their pupils scintillate as they dig in the first bites. I enjoy that pause as the flavors wraps around their taste buds, the scents and aromas arousing their senses. I am at my happiest when I gather people I love and respect around food. I know that'd make my grandmother smile. 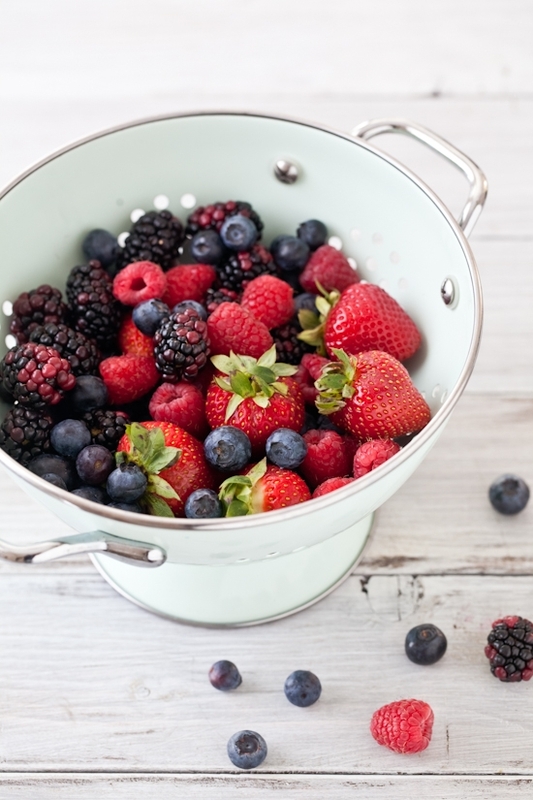 There were so many luscious berry baskets at the farmers market this past week that I got a lot of everything. Blueberries, blackberries (twice), strawberries (again), raspberries (always). Stone fruits and rhubarb also ended up in our basket but that's for another get together later this week. It's summer! The house is open to anyone with a good story and a smile. 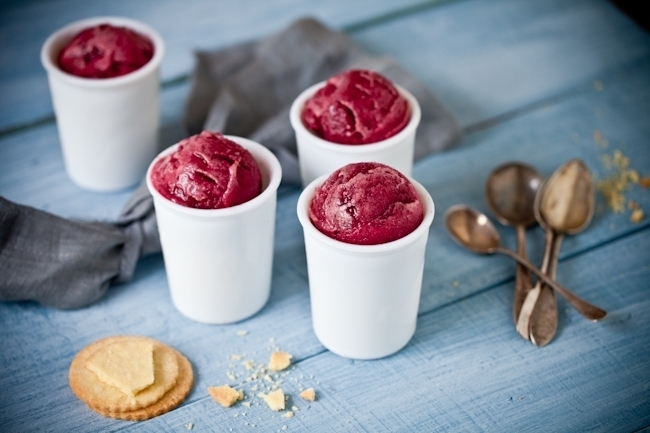 This sorbet is my go-to recipe as I can change the fruit according to the season and always get the same delicious result. Tart and sweet flavors. You can really taste them all separately and together with every bite. 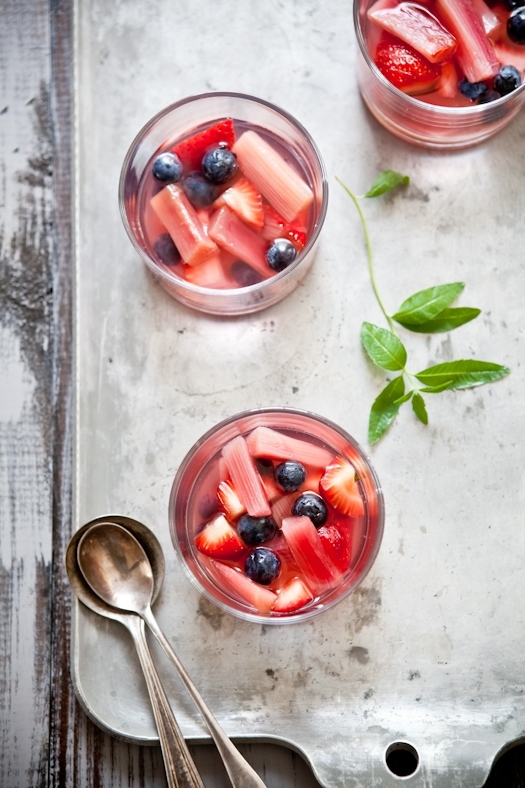 Paired with a simple vanilla shortbread cookies and you have one of our favorite summer treats. Now...I need to fly home and find that sorbetiere my mom bough when we were kids...! 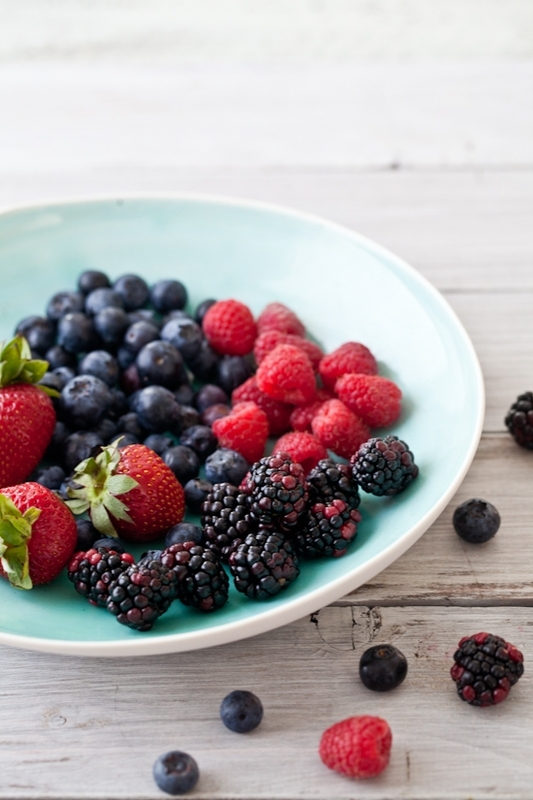 In a medium saucepan set over medium high heat, place the berries and the rest of the ingredients and bring to a quick boil. Reduce the heat to low and simmer 10 minutes. Remove from the heat and let cool completely. Puree until smooth in a blender or food processor and then strain through a fine mesh chinois (strainer). Process in your ice cream machine according to the manufacturer's instructions. Makes about twenty 2-inch round cookies. In the bowl of stand mixer fitted with the paddle attachment, whip the butter and egg yolks together on medium speed until creamy looking. Split the vanilla bean in half and scrape the seeds with the back of a knife and add to the butter and sugar mixture. Mix for 10 seconds. Add the millet and sweet rice flour with the mixer still on low speed. If the mixture feels too crumbly add a little bit of milk to obtain a smooth but not too wet dough. Start with one tablespoon at a time. Roll the dough in between 2 sheets of parchment paper and roll to about 1/4 to 1/8-inch thick. Cut cookies out in the dough and place them on a parchment lined baing sheet. Bake for 10-12 minutes or until golden. My parents flew back to France yesterday and everyone in the house woke up a little different. Even the pups who kept going up and down the stairs looking for them. We made coffee, went on the back deck and sat in silence. Heard the clap of the oysters around us. Something my mom would have inquired about. Something my father would have turned into a story. We had a wonderful time together. It always takes a few days for everyone to find their marks and settle into a groove. That's a given. Each of us has a different schedules, different responsibilities and timing. We all have one thing in common though: we like food. More importantly, we like everything about it. We like to head out early to the farmers market and get our groceries for the week. We like to prepare it, chop it, cook it, grill it, all the while catching up about the rest of the family news. We like to sit down and share a meal together where we have put forth the textures, scents and flavors of the foods we made. By doing do, we pay homage to the people who cared to grow it and the people who taught us how to love it and share it with friends and family. So even if my parents and I need a little adjusting at first, we know we always have meals to come together around something we all understand and appreciate. I was happy to make some time to truly enjoy my parents' visit, after the last few months of a frantic schedule. It's sometimes difficult to explain that time spent on the computer writing proposals and looking over shooting schedules is not time spent noodling around. That's a generation thing. That's part of sharing space and time for a few weeks. It requires patience and understanding from everyone. Cooking and baking also requires patience and understanding, reinforcing this idea of a common ground for everyone to share. 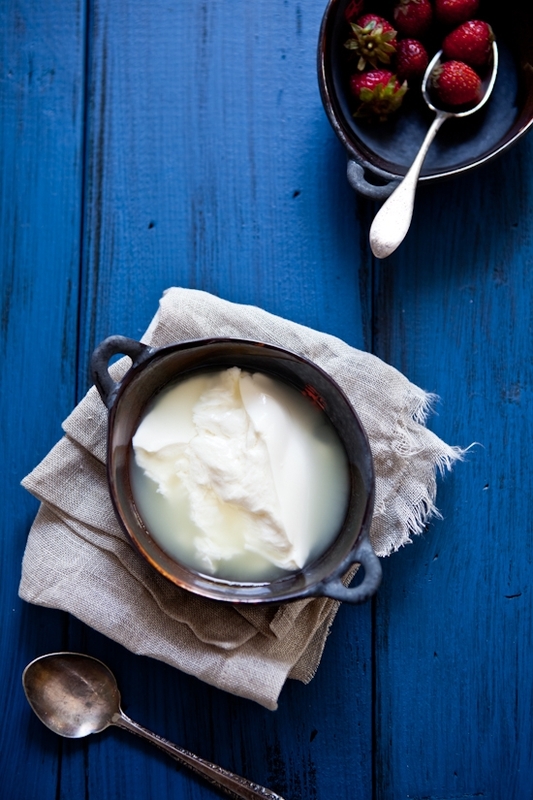 Nothing is truer in my opinion than when making fresh cheese, yogurt or fromage blanc. Anything with live cultures (bread too) has a wonderful way to show us how to slow down a bit and enjoy the process, the evolution and transformation of what we make. Everytime my parents are here, I make faisselle for my dad. I often try to describe it properly but it is truly one of those dairy products that is unique. 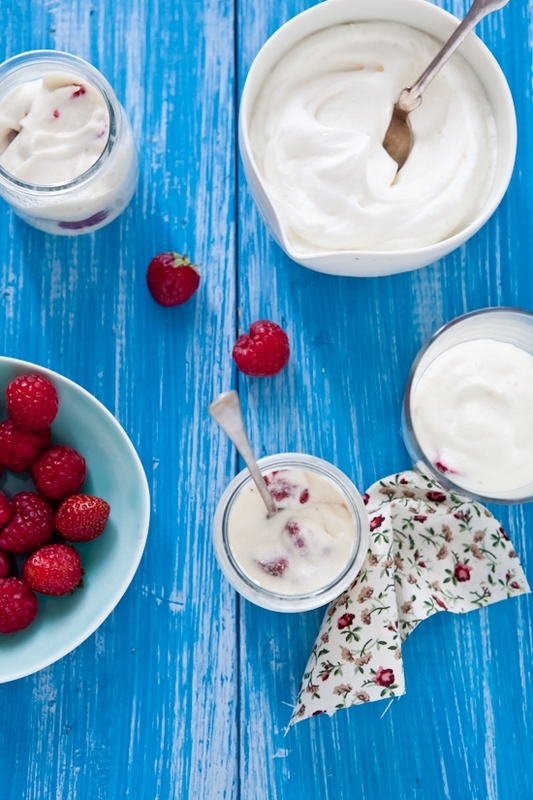 Not yogurt, not fromage blanc, not cottage cheese. Faisselle refers to both the fresh cheese made as well as the container used to make it. The molds have lots of tiny holes in which the milk mixture is placed to drain as much whey as desired. Some people like their faisselle drier than others so the container allows you to control how much moisture to keep. The making process of faisselle is really darn easy and can be made with either cow or goat milk, a few drops of rennet, and a bit of fromage blanc or Greek yogurt for more live cultures. That's it! Once mixed, I let it do its thing overnight and we wake up to wonderful big curds of faisselle. So far I have not tried with non-dairy milk but if you do let me know how it turned out. Some people like it at the end of the meal with some salt, pepper and freshly chopped chives, some appreciate it with some brown sugar or a touch of honey. With us, it all depends on our mood. Sometimes we drain the heck out of it and end up with something very close to fresh crumbly cheese. Sometimes we'll just grab a bigger spoon and eat as moist as possible. Sometimes, I sneak around and put some faisselle aside to make something special like these little jars of Fontainebleau, a mousse made with faisselle, whipped cream and fresh berries. It is really the kind of dessert we enjoy all year long by letting the seasons guide our choice of fruit. Caramelized pear or bananas easily replace fresh berries during the winter months and fresh figs with a touch of honey make a perfect topping in the deep of summer. 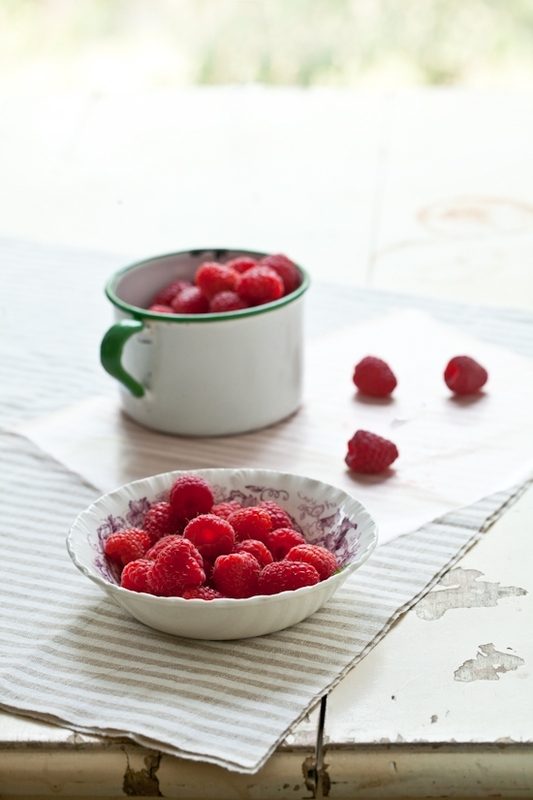 We went strawberry picking one day with my parents and even after jamming 16 pounds worth of berries, we still had extras that we used in the Fontainebleau along with some freshly picked raspberries from a friend's garden. Feel free to use any fruit, berries or addition that strike your fancy. Crumbled shortbread on top is darn good too...! Notes: when our farmers market is open (April through December) I will use raw goat's or cow's milk. The rest of the time, I use whole, non homogenized, organic milk. I use liquid vegetarian rennet by habit but tablets work just as well. 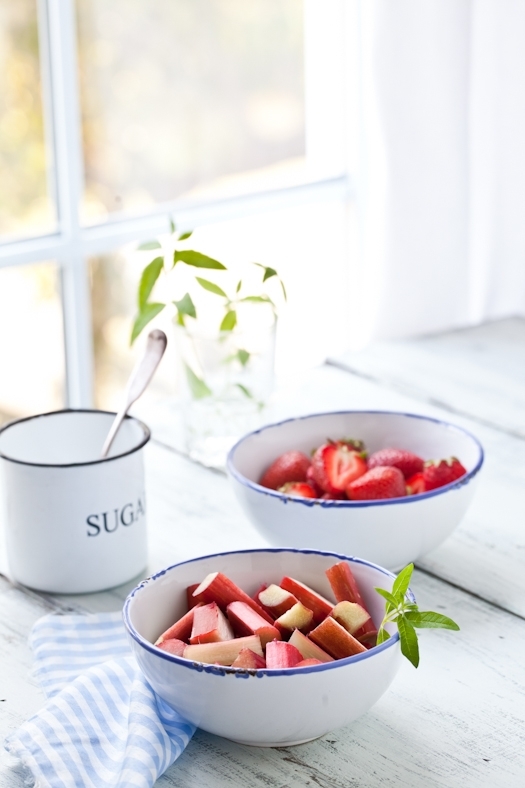 Place the rennet in a clean glass or ceramic large bowl. 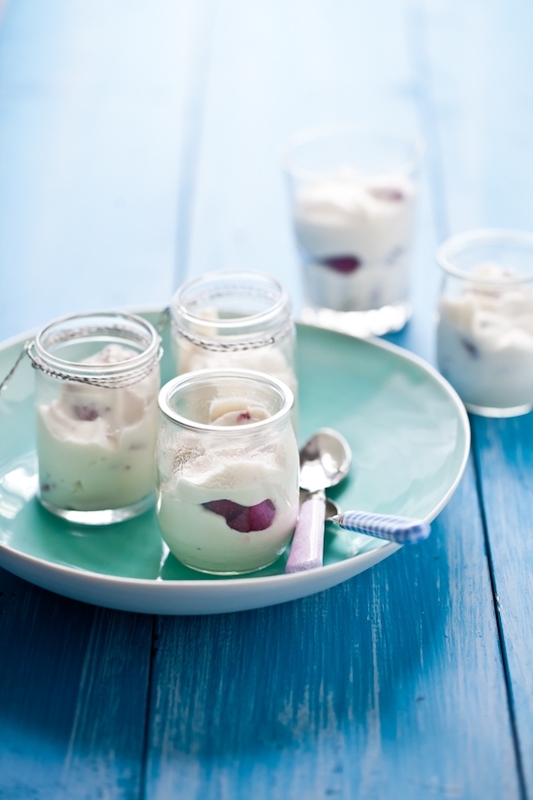 In a heavy saucepan, combine the milk and Greek yogurt and bring the mixture to 85F. Remove from the heat and slowly pour over the rennet. Do not stir. Let cool, cover with a clean kitchen towel and let sit undisturbed for 4 hours. 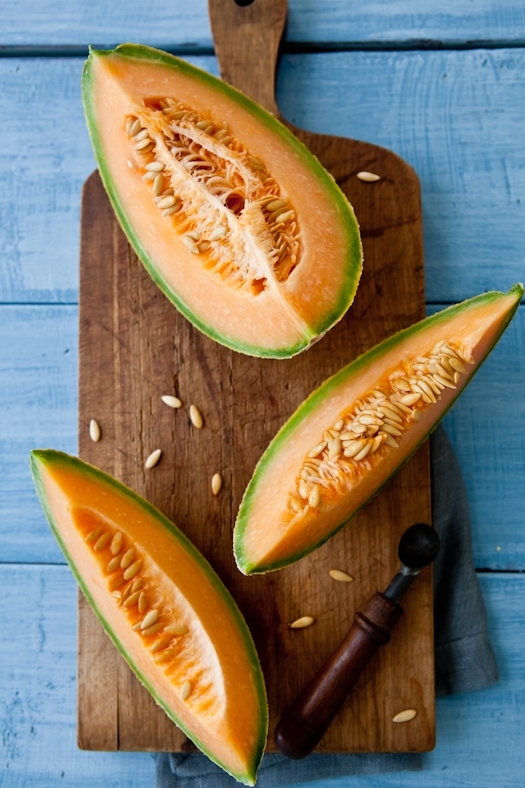 Place in the refrigerator and let sit overnight to develop more taste. The next day, take out about 2 cups of the faisselle and drain in a cheesecloth over a pan or the sink (attached to the faucet works great) until most of the liquid is gone (takes anywhere from 2 to 4 hours). 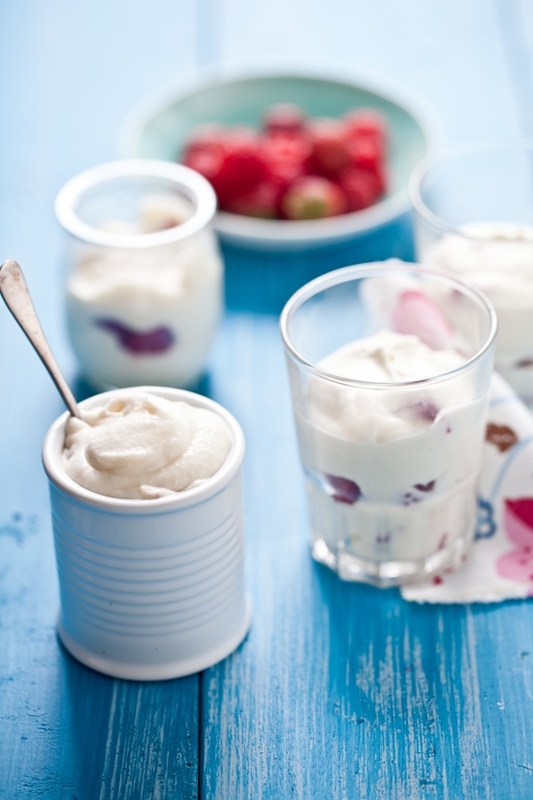 When ready to use, slowly fold in the whipped cream and divide in jars by layering the mousse and the berries. 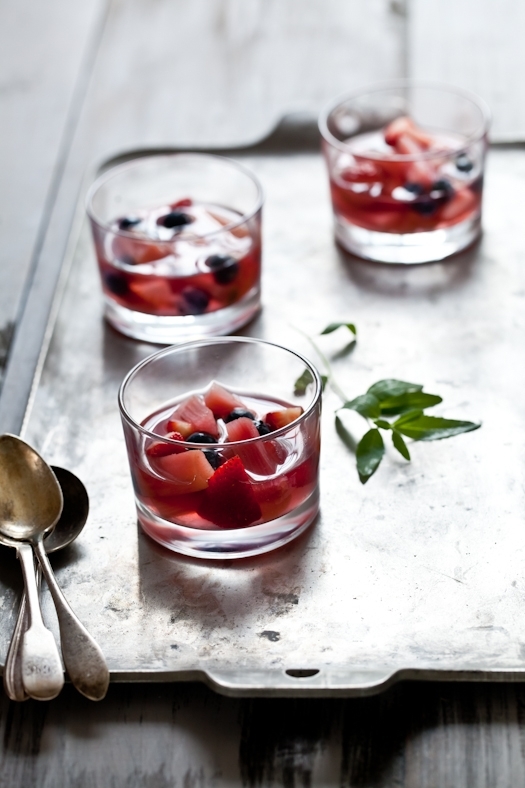 You can also, mix the berries as you mix the faisselle and whipped cream. Keep refrigerated until ready to use.